He’s the Vinyl Detective, a connoisseur of LPs and an expert in tracking down the rarest and most elusive gems (in perfect condition, naturally). In Written in Dead Wax his unique skill set took him on an adventure that stretched from South London to the West Coast to uncover the fate of the greatest forgotten star of the 1950s jazz scene. Now when a mint copy of the final album by “Valerian” – England’s most notorious lost rock band of the 1960s – surfaces in a charity shop, a series of events is triggered that only our hero can solve. As old friends and professional contacts of the band’s tragic singer start to come out of the past the Vinyl Detective finds himself at the whirlwind centre of a rock’n’roll reunion. Can he separate the truth from the urban legends to discover what really happened to Valerian, and more importantly, her missing son, all those years ago? 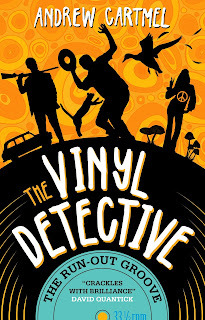 Along the way he’ll find himself at the wrong end of a shotgun, unknowingly dosed with LSD as a prelude to being burned alive, and then there’s the grave robbing… It’s all just in a day’s work for London’s one and only Vinyl Detective. Andrew Cartmel is a novelist and screenwriter. His work for television includes Midsomer Murders and Torchwood, and a legendary stint as Script Editor on Doctor Who. He has also written plays for the London Fringe, toured as a stand-up comedian, and is currently co-writing with Ben Aaronovitch a series of comics based on the bestselling books. A witty, contemporary crime series where Lovejoy meets High Fidelity, and the right record can be quite literally to die for, The Vinyl Detective: The Run-Out Groove is released on 9th May and is available for pre-order now.